This page covers advantages and disadvantages of GUI Interface. It mentions GUI Interface advantages or benefits and GUI Interface disadvantages or drawbacks. The GUI term stands for Graphical User Interface. It is the interface where images are used to represent different choices. The choices are designed as per requirement of the end user applications. Operating systems which support GUI interface include Windows, Linux, iOS, MacOS, Android etc. The programming languages which can be used in GUI based applications are VC++, C++, C#, PHP, Java script, Ruby, Objective-C, Python, Perl, .Net, HTML, Labview, MATLAB GUI etc. GUI language usually include elements such as windows, menus, icons, numeric/boolean controls & indicators, tabs, selection, graphs etc. 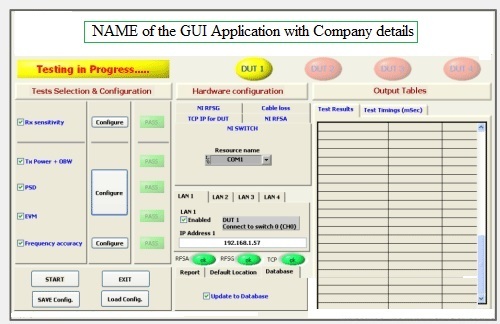 The same has been depicted in one of the GUI interface developed using labview. ➨It requires just a click on the simple picture or image in order to use its functionalities. ➨It is very easy to use by novice as it is user friendly. ➨Simple icon in GUI interface uses multiple instructions in the back end. Hence it is easy for the programmer to code in GUI languages (such as VC++, VB, C#, .Net, Labview etc.) compare to other non GUI based programming languages. ➨Programmer or user need not have to understand working of the computer system. ➨It looks very attractive and multi-coloured. ➨It is much better than command driven interface which has many drawbacks. ➨User can switch quickly between tasks on the GUI interface. ➨Full screen interaction is also possible with quick and wholesome access to anywhere on the screen. ➨It uses more computer memory as the aim is to make it for user friendly and not resource optimized. As a result it can be slow on older machines. ➨GUI becomes more complex if user needs to communicate with the computer directly. ➨Certain tasks may take long due to many menus to select the desired choice. ➨Hidden commands need to be searched using Help file. ➨GUI based applications require more RAM in order to run. ➨It uses more processing power compare to other interface types.